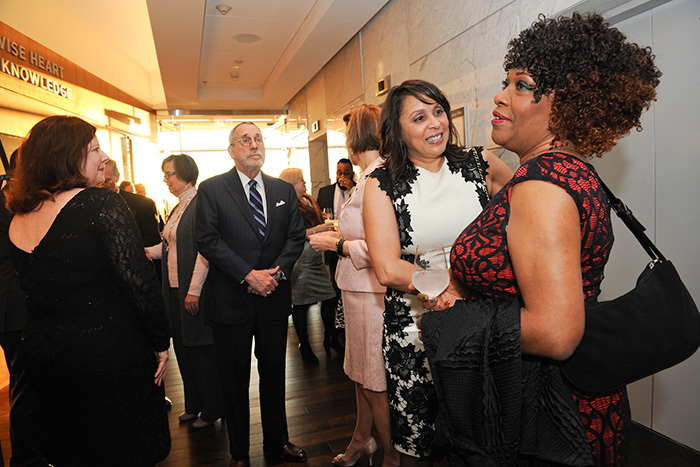 Rita Dove (right) speaks with Emory professor Natasha Trethewey at the Twelfth Night Revel. Both are former U.S. poets laureate. 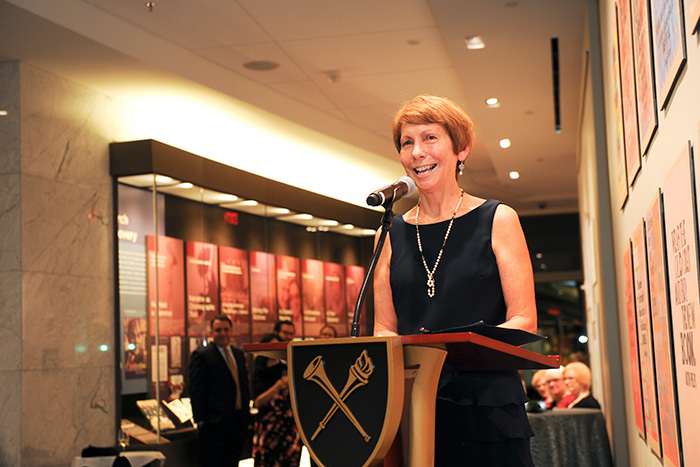 Rosemary Magee, Rose Library director, welcomes guests to the first Twelfth Night Revel held since the library's reopening after extensive renovations. University Librarian Yolanda Cooper speaks at the Twelfth Night Revel. 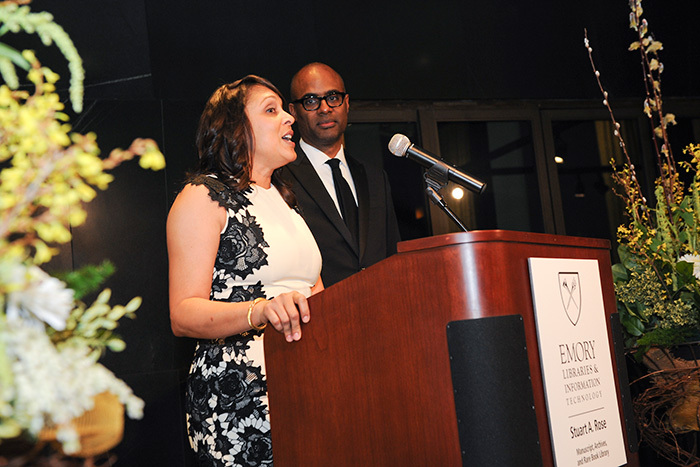 This year's Chief Revelers were Trethewey and fellow Emory professor Brett Gadsden. 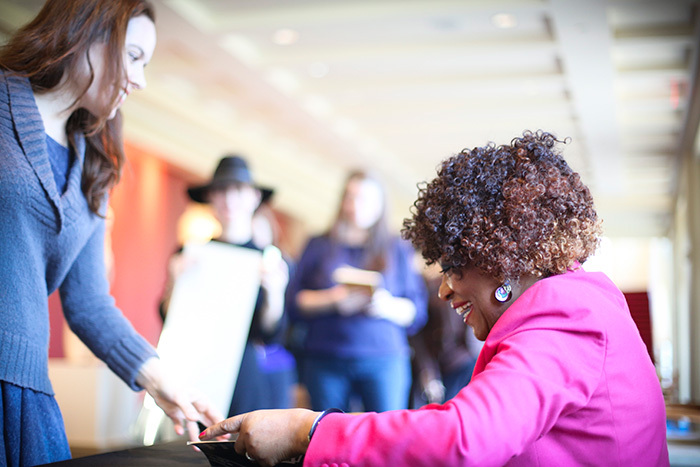 The day after the Twelfth Night Revel, Rita Dove gave a free public reading at the Schwartz Center for Performing Arts. Dove signed books and met with attendees after the reading. Twelfth Night Revel photos by Becky Stein. Schwartz Center reading photos by Emory Photo/Video. Stuart A. Rose Manuscript, Archives and Rare Book Library. Pulitzer Prize-winning poet and former U.S. 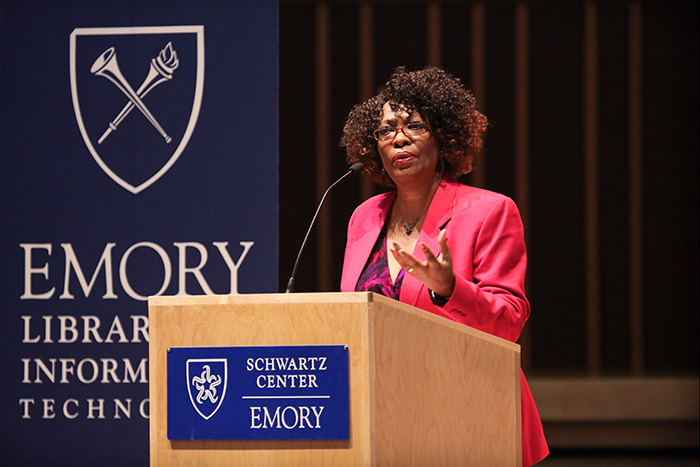 Poet Laureate Rita Dove visited Emory for two events over the weekend. On Saturday evening, Dove was the guest of honor and read a poem at the Twelfth Night Revel, the annual literary celebration and fundraiser for Emory's Stuart A. Rose Manuscript, Archives and Rare Book Library. 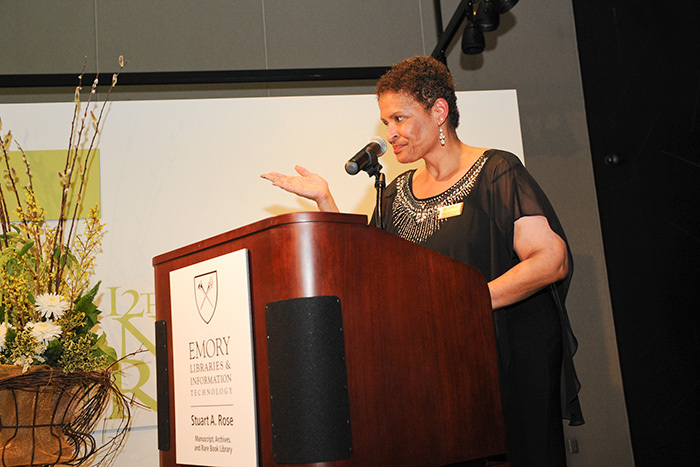 She joined this year's Chief Revelers, Emory professors Natasha Trethewey and Brett Gadsden. Trethewey served as U.S. poet laureate from 2012 to 2014 and is Robert W. Woodruff Professor of English and Creative Writing. Gadsden is an associate professor in the departments of history and African American studies. On Sunday, Dove gave a free public reading on campus, offering insight and inspiration to a diverse crowd in Emerson Concert Hall of the Schwartz Center for Performing Arts. She delivered the keynote address at Emory’s commencement in 2013, where she received an honorary doctor of letters degree.